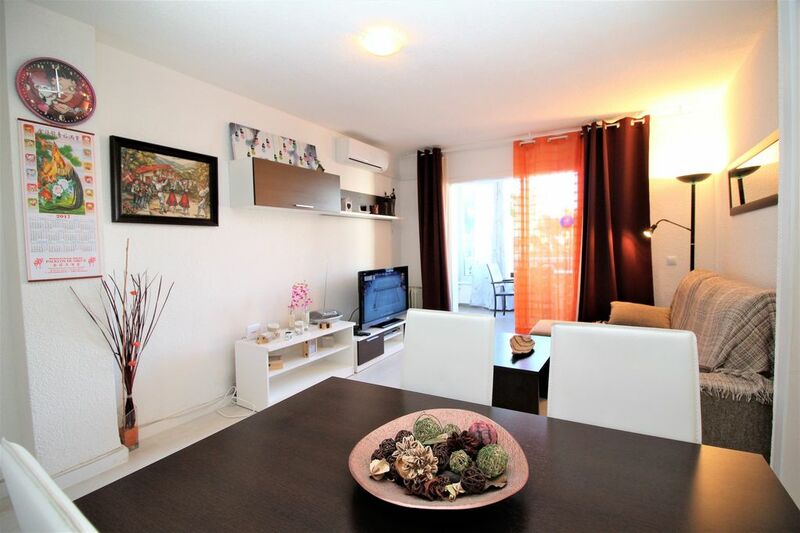 The apartment is nicely furnished, is modern, and has 80 m². It has views to the sea and to the mountain. The accommodation is equipped with the following things: elevator, garden, garden furniture, fence parcel, 15 terrace square meters, iron, internet, hair dryer, balcony, childrens area, tennis court, electric heating, communal swimming pool, open-air car parking based on availability, 1 fan, 1 tv, satellite (Languages: Spanish, English, German, Dutch, French), stereo, dvd. In the vitroceramic independent kitchen, refrigerator, microwave, oven, freezer, washing machine, dishes/cutlery, kitchen utensils, coffee machine, toaster, kettle are provided. It is located 20 m from Supermarket 24 supermarket, 30 m from Parada local bus station, 150 m from Levante sand beach, 200 m from Cable ski acuático skiing resort, 300 m from Indoor Market supermarket, 350 m from Mas y Mas supermarket, 600 m from Cala del Tio Ximo rock beach, 700 m from Carrefour Express supermarket, 2000 m from Aqualandia water park, 3 km from La Estación Benidorm bus station, 3 km from Poniente sand beach, 4 km from Benidorm train station, 6 km from Terra Mitica amusement park / theme park, 7 km from Las Rejas golf course, 10 km from Golf Bahía golf course, 10 km from Aqua Natura water park, 10 km from Zoo Terra Natura amusement park / theme park, 15 km from Pantano La Vila , 20 km from Algar , 45 km from Renfe Terminal Alicante train station, 55 km from El Altet airport, 146 km from Manises airport. The house is situated in an animated neighborhood next to the sea. There were a number of issues with the apartment, chipped furniture, poor kitchen utensils, bad mould covering almost the entire length of one wall. the pool was closed which was a disappointment. parking could be a problem!! That said the rest of the apartment was good, very comfortable beds, nice balcony and good location. Would I go back? probably yes, but it does need a slight refurb.